A quick update on progress – see our Crysis Thread for more posts and movies – we have a work flow in place to take any model from the Google 3D Warehouse and import it into Crysis. 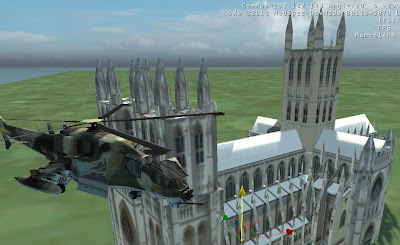 The image above is the Washington National Cathedral – direct from the 3D Warehouse. It gets around the multiple texture limitation and seems to be working so far – we are currently working on importing the Church from our Churches: Modelling Architecture post. Wheres the tutorial!! I cant wait for an easy way to import Sketchup models into crisis, we have only scratched the surface of realtime interactive 3d visualisation! Its on its way 🙂 – its proved a bit of a headache to get it up and running but we are almost there, as the screenshot i hope shows. Should be online next week….